Finally, today, you get to see the 5th piece of my Common Threads challenge remix I am doing this month which had yet to be blogged. The 5th piece is this adorable khaki skirt which I have already worn twice. 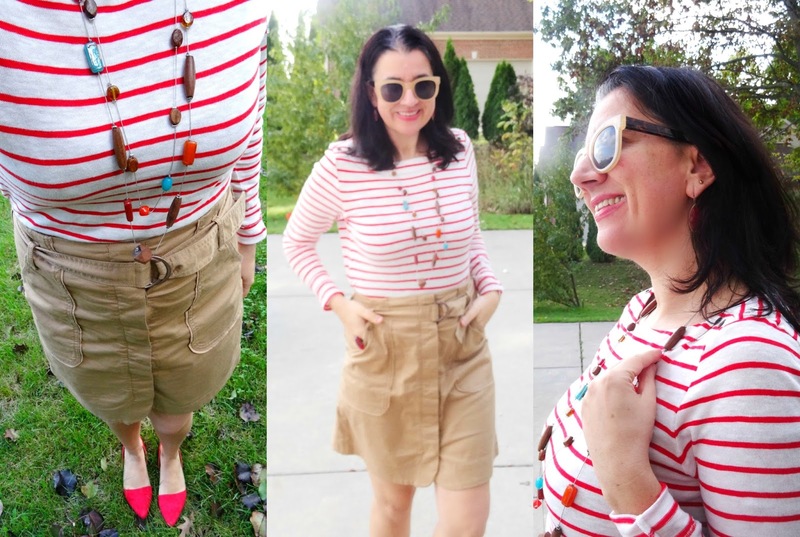 I have always loved khaki paired with red so putting this Khaki Utility Skirt along this Red Striped Ballet Tee was a no-brainer and I loved the results so much, what about you?! 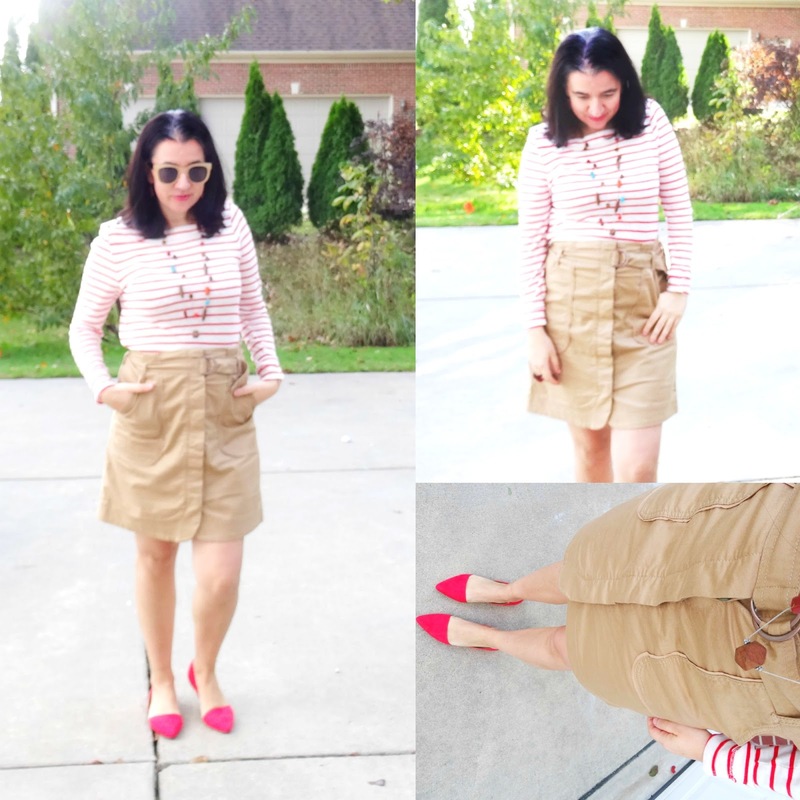 This Khaki Utility Skirt by Loft was the perfect piece to pick as one of y 5 items for the Common Threads Challenge. The neutral earthy khaki color goes with everything. Plus I love the shape and style of this skirt. It is right above the knee, in a button-front style (but the buttons are hidden), it has pockets and a tie belt looped through a double half-circle buckle. Since the skirt has belt hoops you can swap the belt for something different or wear a more classic, dressier, leather belt. Loft describes this skirt as their Tie Waist Cargo Skirt which is another great name I'd use to describe this amazing skirt. Also, even if the fabric wrinkles a little bit, it is forgiving and doesn't look bad. Loft has another similar Olive Cargo Tie Belt Skirt (but I actually like mine more) and both skirts are on clearance currently, with an additional 40% off which makes them under 35 bucks each. 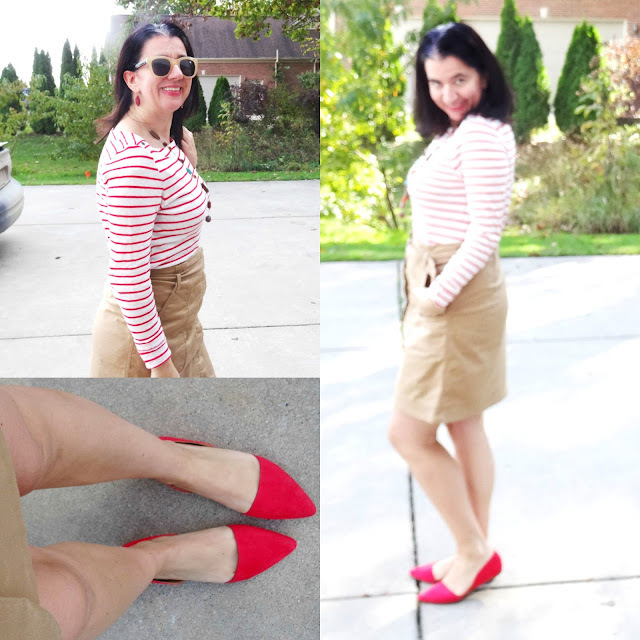 I had been looking for a few years for a great Boat-Neck Red+White Striped Tee and I a so glad I found this one (also at Loft) and it was purchased on the same shopping trip as the khaki skirt. They were having a sale on these great long-sleeve tees that day and they were 20 bucks each. This Red Striped Shoulder Button Tee - I love the metallic buttons on the shoulders by the way, perfectly nautical - also comes in a navy+white option and a colorblocked grey option (which I should have purchased too). These tees are full price currently but through today (Sunday October 15th), Loft is having a 40% OFF your entire purchase sale. Pairing the red stripes with the khaki skirt was a great idea. On Wednesday's post, you will see this khaki skirt again, styled completely different. These Cute Red D'Orsday Faux Suede Flats are adorable aren't they?! I have had them for close to 2 years. But though I have worn them many times and blogged them a few times too, they are not very comfortable. Since I wore this outfit to work on Friday the 13th and I knew these flats would be on my feet for a while, I made sure I added some of those cushiony band-aids on the backs of my feet and these shoes were manageable I must say. A part of me wants to get rid of these and invest on a better, well-made and comfortable pair but a part of me doesn't want to part with these flats yet. This Marc Fisher pair looks very nice and they are currently on huge sale. Marc Fisher makes great shoes which are of great quality and comfortable too. Should I buy them?! Isn't this Long Beaded Two-Strand Necklace perfect for this outfit or not?! It has wooden, red, dark red and turquoise beads. It ties the top and skirt together, perfectly. The necklace (years ago from The Limited R.I.P) also goes so well with those Skinny Oval-Shaped Multi-Faceted Crystal Burgundy Earrings. Every season Loft has similar earrings (the teardrop or oval shape changes slightly) that come in different colors and I already own 5 pairs of these type of earrings and love them. They are light, fun, perfect to add a color pop with jewelry and since they are crystal, they are pretty dressy too. Loft currently has these Dark Grey Teardrop Crystal Earrings and this Turquoise pair (I own all 3 colors this turquoise crystal style came in). Last but not least, I bet you didn't miss y Fun Red Cocktail Ring. It is the boldest stone ring. It looks like glass. It is big, bold and perfectly asymmetric. I have purchased this gorgeous ring on a whim for close to nothing at Wet Seal years ago. I get compliments on it every day from strangers, family, friends, co-workers, my daughter's teachers, etc. Since the stone of the ring is a dark red, it also matches those cute earrings to a T. Oh and this Taupe Sunglasses I have worn so much this year (though I own a ton of Sunglasses) have been purchased for about a year now. Taupe is a year-around color but these are perfect for Fall and yes they are also Loft (head to toe in Loft today - it is one of y most favorite, most-shopped brands you guys). I have noticed in the last couple of years that Loft has some beautiful sunglasses and I have purchased any pairs when they are on sale: usually between 10 to 15 bucks a pair. And the quality of them is great. If you guys missed it, over the weekend I shared a Fabulous 16-piece Fall Capsule Wardrobe for little girls (toddlers through 8 years old). With the kids being back to school, you and them both have less time in the mornings. 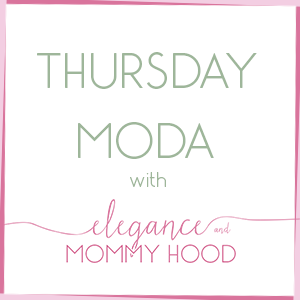 Capsule wardrobes make dressing so much easier and for more you can see it all here. I will be doing one of these for Winter too and the seasons after.